GenTech announces registration for the final two week session of their summer camp, to take place August 5 through August 16. The Aerospace Engineering session will give campers an introduction to flight and aviation while allowing them to explore the elements of the engineering field. GenTech Summer Campers, thrilled with the creation of their own video games containing flying objects and their 3-D animations of rocket designs, will soar to new heights in the final session of camp, centered around Aerospace Engineering . Registration for this session will take place August 5 through August 16 on the campus of the University of Illinois at Chicago in partnership with the Aero-Star Group and Lewis University. Participants will gain an introduction to flight & aviation, while exploring the elements of one field of engineering where there is a current heavy demand. The two-week session will include a trip to Lewis University School of Aviation, where professors will guide 5th through 12th grade students through the world of aviation. Here, students will discover careers and experience the thrills of flying through classroom instruction; attendees will also have the opportunity to visit a 737 and tour the Harold E. White Aviation Center, where they’ll participate in various hangar activities, including pre-flight check-in, and the engagement of a professional flight simulator. Students will also get to see the Doppler radar, the device that provides weather information for the Chicagoland area. During the two-week session, the Aero-Star Group’s Aviation Academic Initiative Program will help guide campers through the evolution of flight, navigation and control, flight fundamentals, space travel, orbital mechanics, and more. GenTech campers will analyze, design, and build aerospace systems and experience the sensation of flight through a second set of simulators. Finally, students will use their knowledge to design, build, and test airfoils and their own model planes to take home. Youngsters in grades 2nd through 4th will also experience the thrill of flight in their own session, “Building & Flying Rockets!” Through the use of model rockets, campers will learn about space exploration and physics. Campers will make their own model rockets and blast them into space, attempting various challenges for a variety of exciting prizes. The summer camp’s collaborative effort is designed to aid young people in expanding their horizons and broadening their perspectives regarding their college and career options. The August session also includes GenTech’s hallmark classes in Video Game Design & Development and Creating the Animated Cartoon, in which girls and young women are strongly encouraged to register. Registration for Session 4 at GenTech Summer Camp is now open with limited matching grants available. Enrollment for GenTech Summer Camp 2014 begins January 2, 2014, with registration for the school-year GenTech Saturday Program, where many of the same courses are offered, begins Tuesday, September 3, 2013. For further information regarding registration and courses available, interested parties should contact GenTech at info(at)mygentech(dot)net or call 773-324-7772. GenTech Digital Media & Technology Center is a not-for-profit educational organization with a mission to engage, empower, and educate youth, teens, and adults to creatively integrate digital media and technology into their academic, personal, and professional lives in preparation for 21st century colleges, careers, and entrepreneurship. GenTech helps students expand their horizons through developing the confidence to explore, the intelligence to discover, and the leadership to build with excellence. Our students are well-positioned for entry into top digital media and technology programs in colleges and universities around the country. 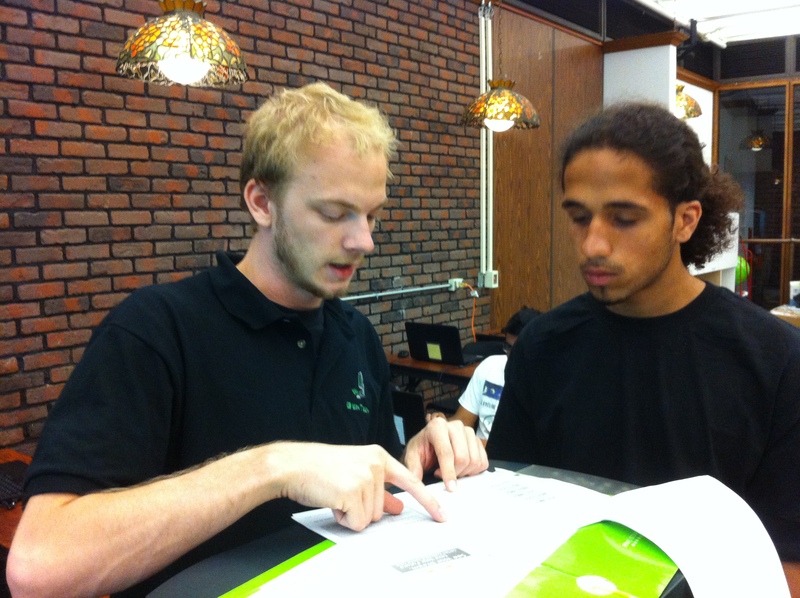 Game Design Teacher, Ren Wilkey, developing a Protege, Isaiah Llinas in 2-D and 3-D Game Design and Animation. 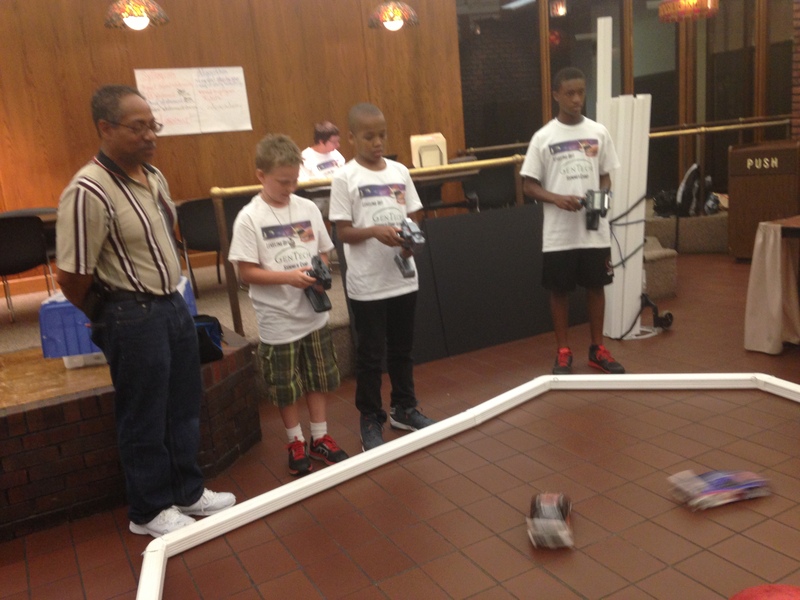 Campers learn aerodynamics through building, programming, and racing Remote Control Cars. 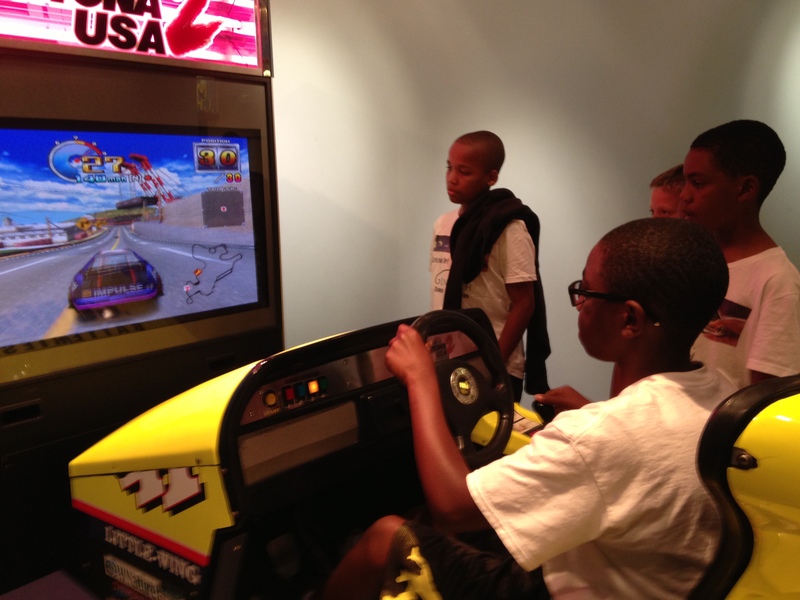 Campers apply the principles of aerodynamics in these racing car simulators. 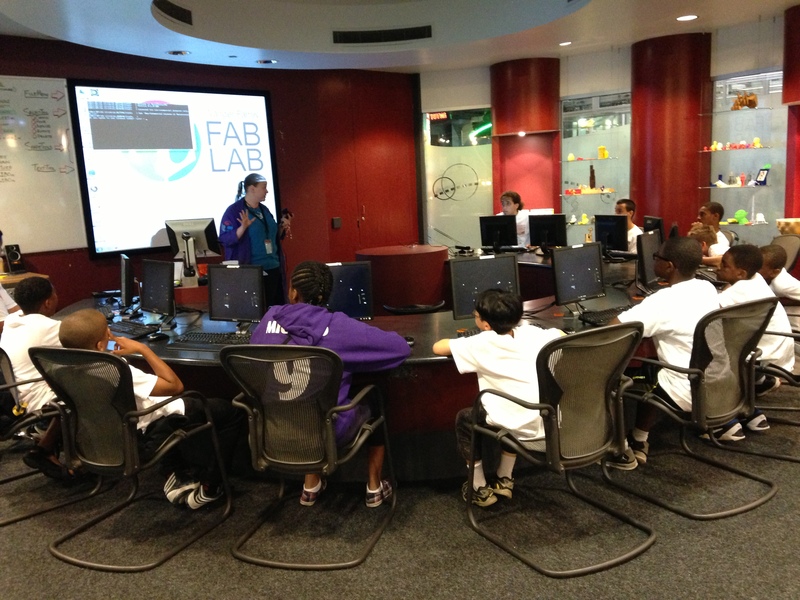 Campers fabricate images of themselves in the Fab Lab with 3-D printing.